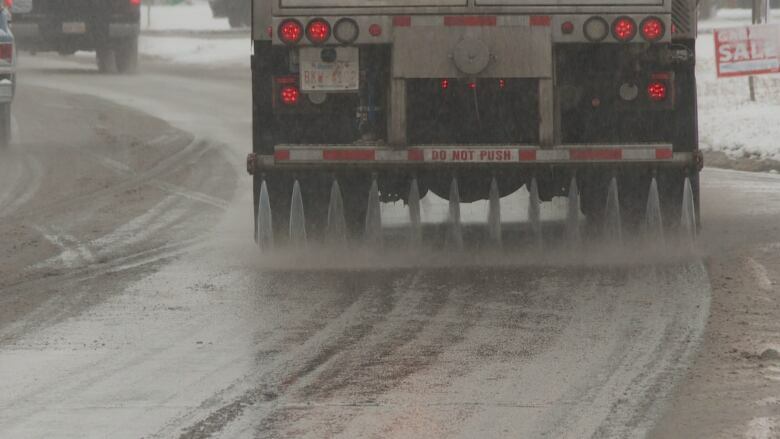 The city will continue piloting an anti-icing agent on Edmonton streets despite the gaining controversy over the issue. The city will continue piloting an anti-icing agent on Edmonton streets despite controversy over the program. At a meeting Tuesday, city council agreed to follow through with the pilot until the end of the winter, despite city findings showing the city's calcium chloride brine damages roads 20 per cent more than salt alone. Coun. Jon Dziadyk said Edmontonians have a strong opinion on the use of calcium chloride. "I've heard quite clearly from them, generally speaking, overwhelmingly people don't like the product." Gord Cebryk, deputy city manager of operations, still recommended continuing the pilot so the city is able to draw full conclusions on the impact of calcium chloride on infrastructure. The findings from a spring study were outlined in a memo in June 2018. That memo wasn't shown to council and only made public last week after media asked for it under a Freedom of Information request. Coun. Aaron Paquette wanted to make sure the findings will be transparent and made available to the public. Paquette was one of six councillors who voted against extending the pilot last October. "It just comes down to trust. We just need the public to have trust that we're trying to do the right thing." Some residents, observing more rust on their driveways and vehicles than in previous years, are blaming calcium chloride. Several councillors, including Coun. Michael Walters, expressed the need to see the pilot through the winter to also determine the role salt is playing in corrosion. "It's probably the percentage of the ratio of salt in the mix, that's probably the culprit," Walters said. "That's what the pilot is supposed to take us through, and so by the end of this, we may not have the exact answer but we should be a lot clearer on what the best way forward is." Calcium chloride ending up on driveways and vehicles is likely coming from sources other than the city project, Walters suggested. The province uses a calcium chloride solution on highways like Anthony Henday Drive. During the first year of the Edmonton pilot project, the city used the solution on three per cent, or 2,840 kilometres of road. In October, council voted to expand the project to another 295 kilometres of road. "My assertion is that it's a bit of a stretch to suggest that calcium chloride is behind the alleged carnage that's being reported to people's vehicles and private property," Walters said. Gord Cebryk, deputy city manager of operations, agreed it's difficult to pin down what's causing damage to private driveways, noting that some residents buy bags of salt containing the same substance. "Unless you have a control point and have some definite observations on that particular driveway and what's going on and off of it, it's hard to say." Walters noted that safety and esthetics were two reasons the city decided to try calcium chloride and move away from sand and tiny rock chips. "We can go back to sand and get a whole bunch of other emails from people who think the city's ugly, but that's the trade off." The operations branch will analyze data from the pilot project and is expected to check in with council in June with a full update in August.